My Rip.Mix.Feed video is a kind of sidebar to my Major Project, which is about the use of Augmented Reality in creating new types of interactive books and other media. One of the challenges that I encountered in researching Augmented Reality was in understanding what is known as the “immersive” effect that the technology creates. The idea of an immersive experience that goes beyond the limited example of a digital pop-up illustration is hard to evoke when describing pages in a book. For reasons that are explored in my Major Project, it is actually easier to imagine of AR virtual elements floating in a three-dimensional space than on the printed page of a book. 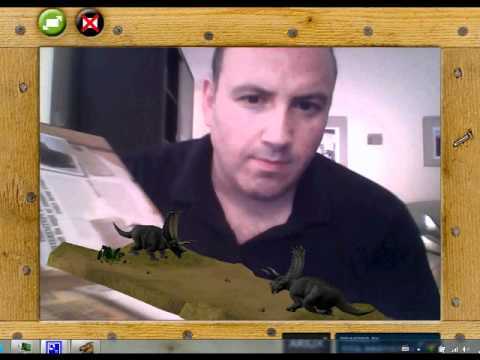 In order to satisfy my own curiosity about the latest in augmented reality book publishing, I ordered author Robert Mash’s and illustrator Stuart Martin’s book Dinosaurs Alive!, which is published in the UK by Carlton books. It is the most advanced example of an AR book that I could find. This video I made is basically a walk-through of the book that tries to highlight its educational potential along with its great visual effects. I tried to show how the book’s editorial, artwork and layout features are designed to respond to the inclusion of AR in the content. This helps to give a visual example of some of the ideas I discuss in the Major Project. The reason that I chose this book was that it is clearly intended for older children, at least over 10 years old. It is very dense with information about its subject matter–a survey of dinosaurs and their rise from the earliest species to extinction. Dinosaurs Alive! is definitely an educational book, but the main appeal that sets it apart from other books is the built-in thrill factor of seeing the enhanced dinosaurs do their thing. My Major Project attempts to define some ways in which AR books might offer more than this type of appeal in the future. The black-and-white dinosaur eye design that you see is the marker that triggers and orients the 3D effects. These have been worked into the graphic design of the book using a few repeating visual metaphors, such as the crates that hold the dinosaurs. When you see the dinosaurs walk, turn, or fight each other, I am clicking the arrow keys and space bar to make these actions happen from outside the frame. I have also created a Youtube Channel that compiles many of the videos that I used as research and information in writing my Course Assignment. It links the best examples I could find of AR technology that is used in table-top situations. I hope you enjoy the video; please visit the Major Project page if you are interested in finding out more about this topic.